One bows, then enters the downstairs shrine room. Rows of royal blue and lemon yellow cushions are arranged in short rows on the floor. There are simple but striking fresh flower arrangements done in the Japanese Ikebana style perched on windowsills, shrines and tables. The frosted windows diffuse the light and contribute to the room’s atmosphere of quiet, uncluttered serenity. On Saturday mornings, participants arrive casually for what is known as Shambhala Cafe at the Milwaukee Shambhala Center. The participants greet each other quietly and warmly and before long a gong is sounded to signal the beginning of a half-hour meditation session. A half-hour later, the gong is sounded again. The participants arrange their colorful cushions in a circle. A group reading of a Shambhala text begins — each participant reads a paragraph or two out loud and then passes the book to his or her neighbor until an entire chapter is completed. What does the text mean? How does it relate to my life or my experience? Discussion begins. Sometimes there is incomprehension or tension in the air; sometimes there is knowing laughter. Eventually the coffee and tea are passed and the people break into smaller groups to socialize. The Milwaukee Shambhala Center is one of 150 Shambhala Centers worldwide founded by Chogyam Trungpa Rinpoche, who was born and raised in Tibet in the Buddhist tradition. In 1959, Chogyam Trungpa barely escaped Chinese invaders when he was forced into exile in India. He lived briefly in India before attending Oxford University, where he studied comparative religion, philosophy, and fine arts. Eventually, Chogyam Trungpa gave up his monastic vows, authored more than 14 books on the spiritual path, founded Naropa University in Boulder, Colorado, and established three meditation centers. Chogyam Trungpa desired to present contemplative practice to those who were not necessarily interested in studying Buddhism. Out of this, Shambhala Training evolved, which introduced students to the possibility of integrating meditation practice and study into their everyday lives, and also stressed such arts as flower arranging, archery and dance. The Milwaukee Shambhala Center was established in 1993 in its present location at 2344 N. Oakland Ave., at the corner of Thomas Street. The building formerly housed a plumbing supply shop and has undergone extensive renovation during the past 10 years. It is supported by donations from about 80 active members. The Shambhala Center offers about 50 classes in Shambhala Training each year and brings in many lamas and other expert speakers to lecture throughout the year. 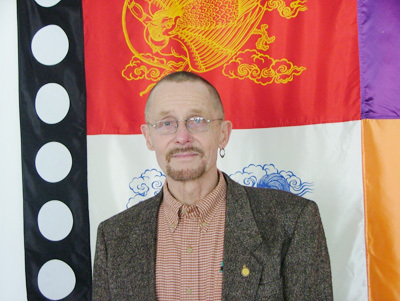 Shambhala Training Director Frank Fischer has been associated with the Shambhala Center since 1995. “When I first got involved, I thought, this is really serious stuff, you know. Then I realized that there was a lot of humor involved and a lot of parties and a lot of good times,” Fischer said. Executive Director Mike Vater was also drawn initially to the people in the Buddhist community, noting that when he first visited the center he “thought these were the kind of people I’d like to spend my time with. They seemed to be high caliber company. A better set than I used to travel in.” Fischer finds that the Shambhala teachings are full and richly rewarding, and notes that he could continue to study for the next 30 years and not run out of profound material, but it is the social aspect of the Shambhala community which he holds most dear. “The object goes far beyond looking at spirituality or religion or something like that,” Fischer said. “It includes community and being part of a group and working with people, and it is just a wonderful group to be with. It’s like having another family. For anyone who doesn’t have a family or didn’t have a good family, who would like to have a positive experience of family, certainly that’s available at the Shambhala.” In addition, to Shambhala Cafe, which is held every Saturday from 9 to 11 am., the Milwaukee Shambhala Center offers an Open House on Tuesday night from 7 to 9 pm, as well as open meditation sessions on Sundays, from 9 to 11:30 pm. Free mediation instruction is available on Saturday morning as well as Tuesday nights. For further information, call 414-277-8020 or visit shambhalacenter.org.